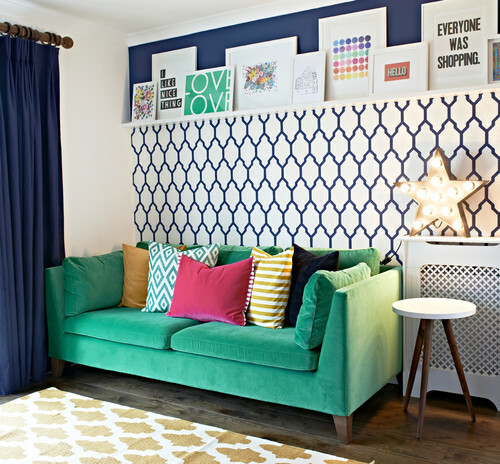 Struggling with a small living room? Or simply not making the most of the space you have? Take a look at these ideas and see how you can maximize wasted spots, from tricky corners to slim alcoves. 1. Go up and over. How often do you think about the space above the doorway in your living room? Probably not that often. But this underappreciated spot can be a handy place for adding storage. Here, the homeowners had narrow shelving units built above and down the sides of the doorway to maximize the wall area. 2. Turn a window into a shelf. This snug room is cozy and welcoming, but the petite proportions mean every inch has to work hard. A coffee table in the center of the room would have obstructed the pathway. By tucking a low table into the window recess, the owners have created a neat perch for a coffee cup without cutting into precious floor space. 3. Use vertical space. Think you don’t have room for a bookshelf? 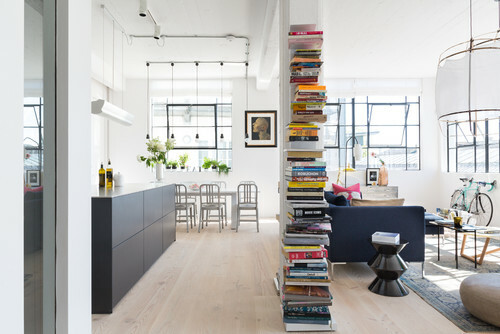 These homeowners tapped into their apartment’s vertical space by installing metal shelves on this concrete pillar to support a tall stack of books. This is an idea that could work in any sliver of wall space. Book towers like this one can be pricey, but compact metal bookshelf brackets are a reasonably affordable option and can be attached to the smallest of wall spaces to create instant shelving. 4. Maximize slim alcoves. 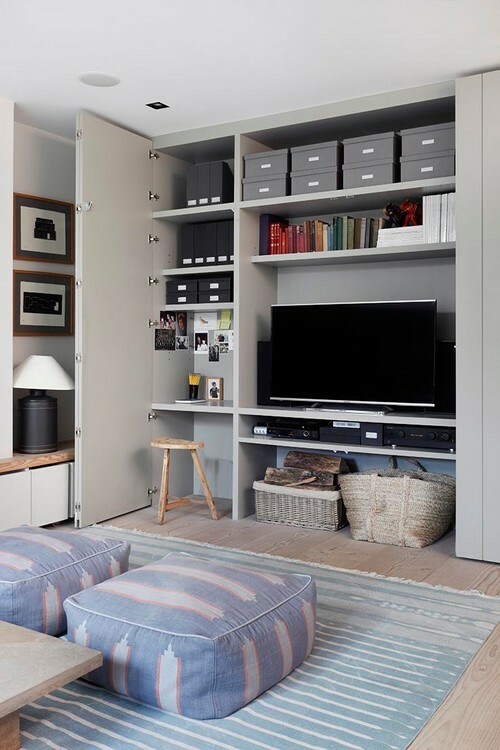 The clever storage choices in this slim alcove ensure that no space has gone to waste in this living room. It would have been tricky to install full-height cabinets in such a shallow spot, so a single row of closed base units that slightly extends into the room has been built instead. Narrow shelving for displaying smaller items covers the rest of the wall. Now everything — books, ornaments, even fireplace logs — has a home. 5. Make a coffee table work harder. 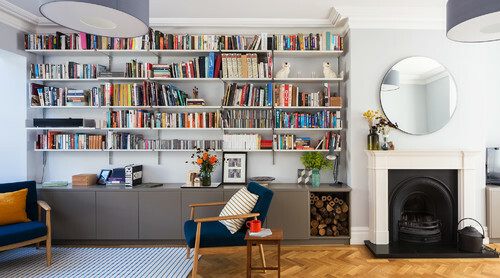 The owners of this bright and airy living room have put their coffee table to work by choosing one with a neat lower shelf for storing books. If you’re going to use valuable floor space for a table, it makes sense to choose one with extra storage, like this one, or a trunk or an ottoman with storage inside. 6. Consider custom built-ins. This tricky-shaped corner could easily have been wasted space, but by building in bench seating and shelving, the homeowners have created a beautiful and practical design feature instead. 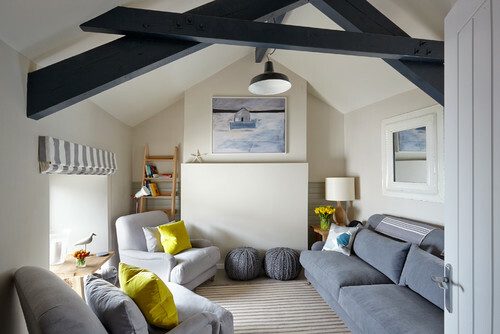 If you have a similarly awkward corner in your living room, talk to a carpenter or builder about a custom solution, and see whether you can use a sloping roof or angled corner to your advantage. 7. Get the most from a nook. 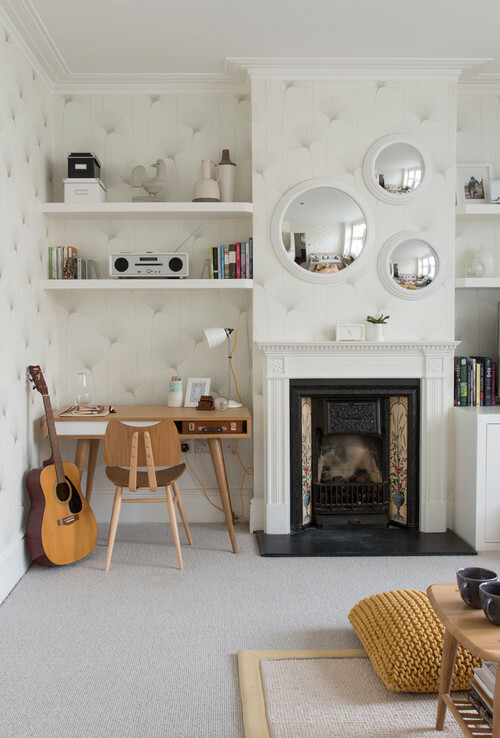 With a bit of creativity, you could squeeze in another living room function by tucking an office into a fireside nook. Here, a small desk, with two shelves above it, makes a stylish workspace, neatly zoned off from the main seating area. 8. Frame the TV. It can be tempting to hang a TV on an unadorned wall, but if you’re tight for space, this is a wasted opportunity. 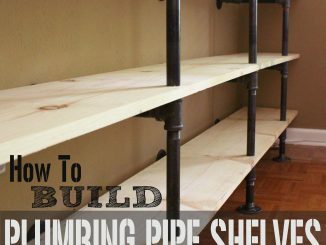 Think about framing the TV with shelving instead. In addition to offering multiple storage opportunities, shelves also can help blend a TV into the room’s design scheme — beneficial if you’re concerned about it standing out too much on a blank wall. 9. 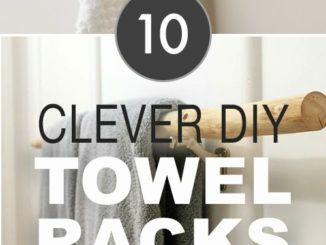 Utilize the wall behind the sofa. 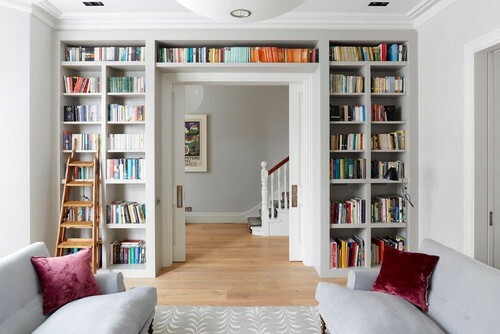 Installing a shelf for books, art or accessories is a smart way to use the often forgotten wall behind the sofa. Run it across the room for maximum impact, or double up with a couple of picture ledges, one above the other, for twice the storage. 10. 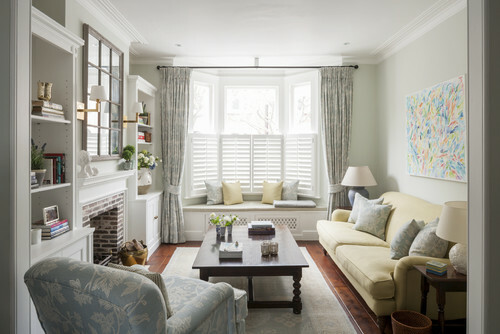 Take advantage of a bay window. If you don’t have a great view from your living room window and have to screen some of it with blinds or shutters, it’s easy to overlook this area. 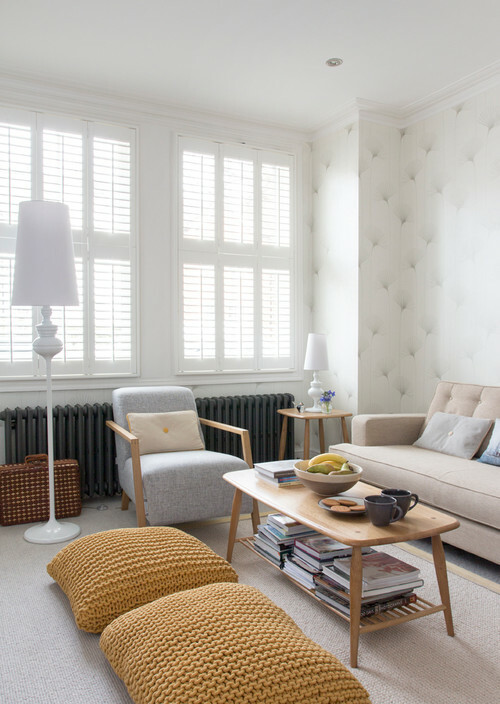 Filling in a bay window with a built-in seat, like the one in this room, is a great way to use otherwise wasted space and create more seating in a compact living room. Incorporating storage into the seat further boosts its use.